Quarterly campaign finance reports were released Tuesday and, for the first time in many years, things are looking good for the Democratic Party. With just over a month to go before the August primary, Anchorage mayor Mark Begich reported $1,034,660 from over 4,000 donors. Ethan Berkowitz raised $226,642 in the second quarter. Diane Benson raised $52,606. Lt. Governor Sean Parnell reported $266,000, in his first full quarter as a candidate. State Rep. Gabrielle LeDoux of Kodiak raised $42,826. US Rep. Don Young, under multiple criminal investigations for bribery, corruption, and extortion, raised $106,616 this quarter, but spent $103,521 of the money on criminal defense lawyers. 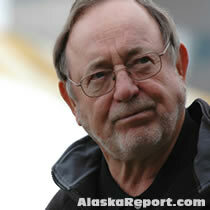 Ted Stevens, also under multiple criminal investigations, raised $745,078. Alaska's primary election is August 26.